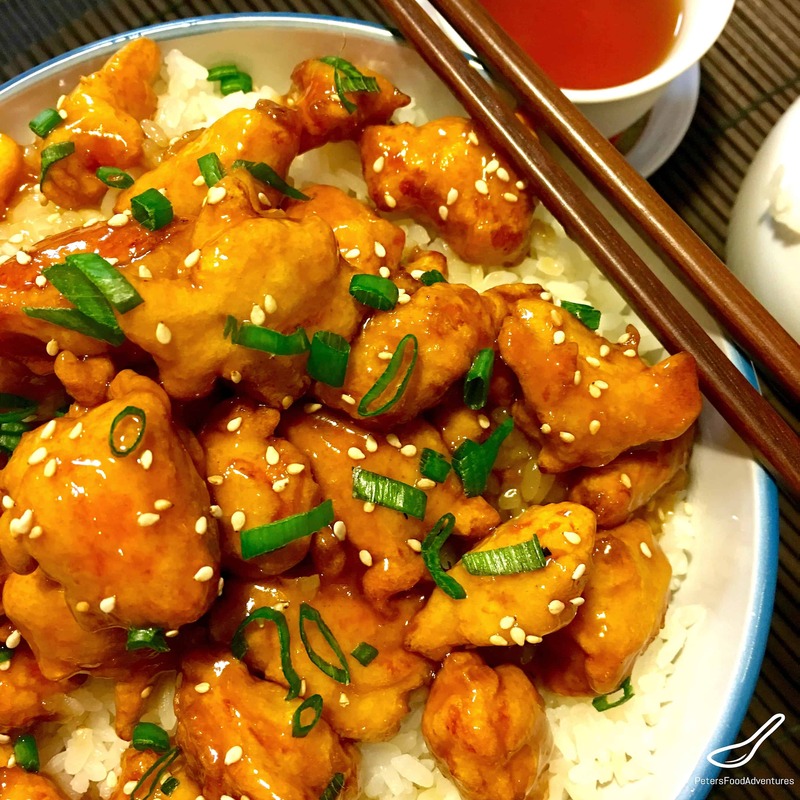 This Honey Sesame Chicken recipe was one of my favorite Chinese restaurant dishes when we lived in Canada. It’s a common dish at the Chinese buffet restaurants, sometimes called Sesame Chicken, which is one of my guilty pleasures. The Asian restaurants in Australia have different types of Western Chinese foods than North America. I miss eating this Sesame Chicken recipe, the Aussies really need to discover this delicious Chinese American dish! This recipe is a basic Chinese fried battered meat recipe, tossed in a sauce. The longest part of this recipe is frying the meat in batches. Depending on how many pieces you fry, determines how many batches are required to get through the battered chicken. You don’t need a deep fryer, I always use a wok, but a saucepan will work too. You can substitute chicken breast instead of chicken thighs, but the thighs are juicier and more flavourful. I suggest that the rice should be cooked and ready, before you toss the chicken in the honey mixture. It goes very quickly from this point, and you will be ready to eat very quickly. The longer the chicken is in the sauce, the soggier it gets. So be quick, toss and serve over the rice. A Honey Sesame Chicken recipe that’s very delicious and easy to make. You don’t need Chinese takeout, this homemade recipe is healthier and with no msg! Bon Appetit! Приятного аппетита! Homemade Honey Sesame Chicken, Who needs takeout? Step by step recipe for a sweet and sticky family dinner favourite. Boneless Chicken, honey, garlic, soy and sesame, served over rice. In a large bowl, whisk together the flour, cornstarch, baking powder, egg, salt and water until the lumps are gone. 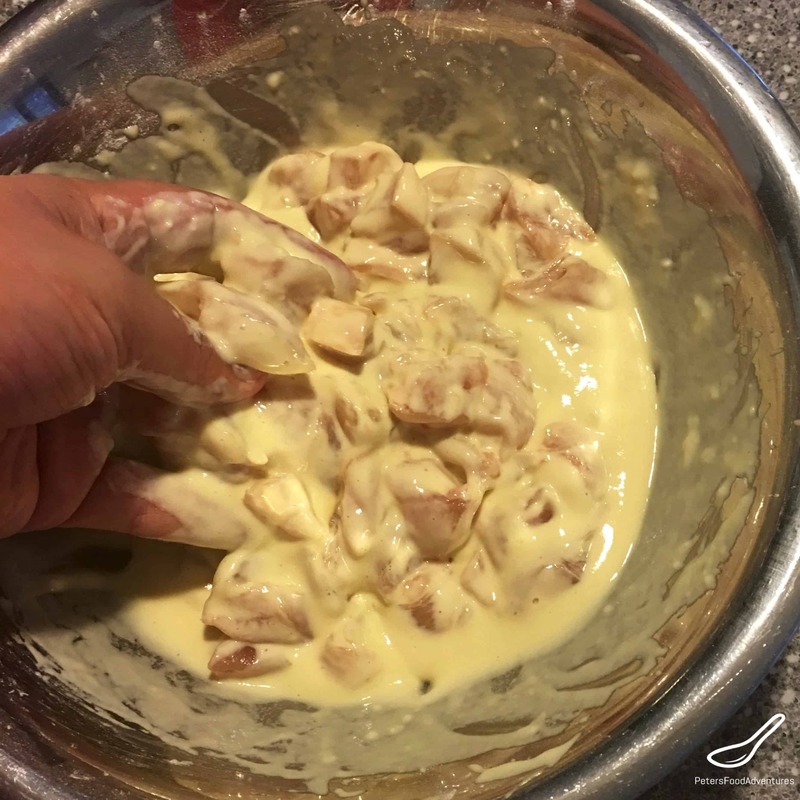 Add the chicken to the batter, mixing together so all the pieces are coated. Leave the chicken in the batter until you are ready to fry. 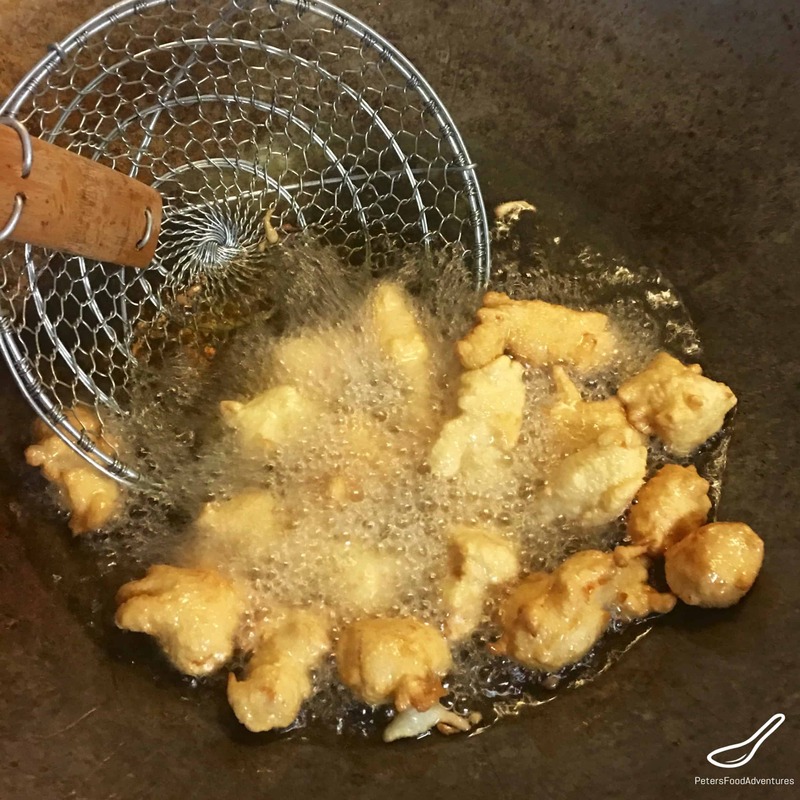 In a wok or saucepan, add enough oil to fry. Should be at least 2 inches deep. Heat oil until hot. 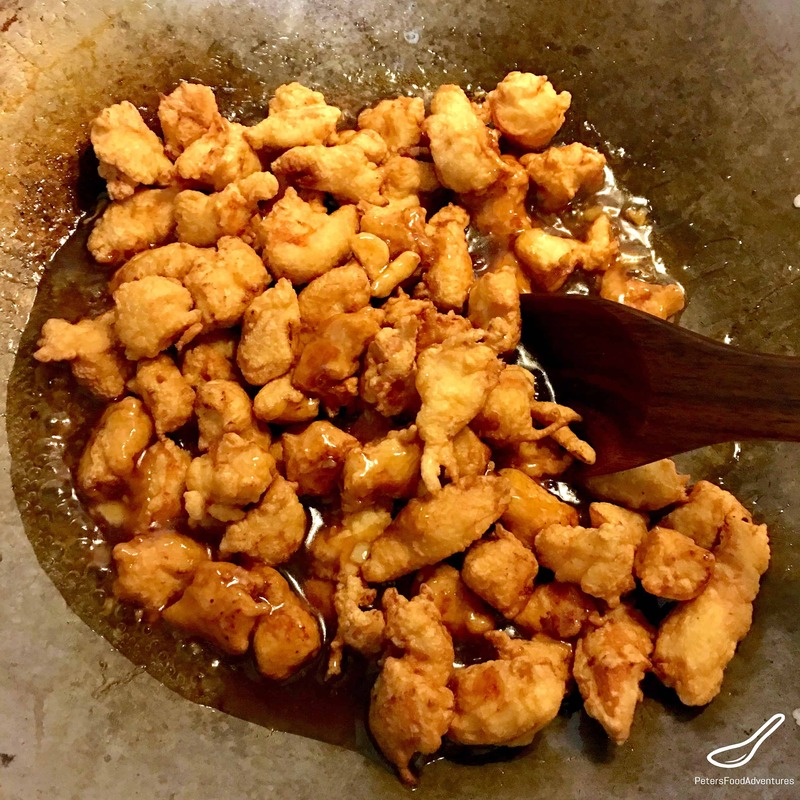 Slowly add the battered chicken, one piece at a time, to the hot wok and fry in batches. Don't allow the pieces to stick together while frying. Constantly turn the chicken with a slottled spoon or scoop, and fry until it turns golden brown. Remove from wok onto a paper towel lined plate. Repeat the process until the chicken is all cooked. In a bowl, mix together the honey, shoaxing wine, rice wine vinegar, soy sauce, sesame oil and water. Set aside. In a small bowl, mix together the cornstarch and water until it's a slurry. Set aside. Add the fried chicken pieces to the honey sauce and toss until fully coated. Serve immediately over rice. Sprinkle with roasted sesame seeds and chopped green onions. That looks so delicious – love sesame and chinese food! And don’t like to do take-out very often-only a rare treat. Always looking for excellent chicken recipes! Thanks Terri! It’s a delicious recipe! Hope you enjoy it! Thanks Rotwein! I’m wanting to make more again! Looks much better than the one I had at the mall yesterday! Thanks so much Lynne for your kind words! Please let me know how you like it! Hope your family loves it as much as mine does! My teenagers will also love making it then devouring it. Thanks for the clear and simple instructions. Pictures really help too. I can’t see any leftovers with this one! Yes definitely no leftovers on this one!!! They polished it all off! Made this for Sunday lunch today. Was a big hit! Good thing I doubled the recipe, enough to fight about who gets it for lunch tomorrow. Perfect! Thanks for the feedback, doubling the recipe is a great idea for larger families. ??? ?